Barry Ritholtz on S.H.A.M.E. profile of Megan McArdle: "if you have any interest in media or journalism, it is absolutely must read material." 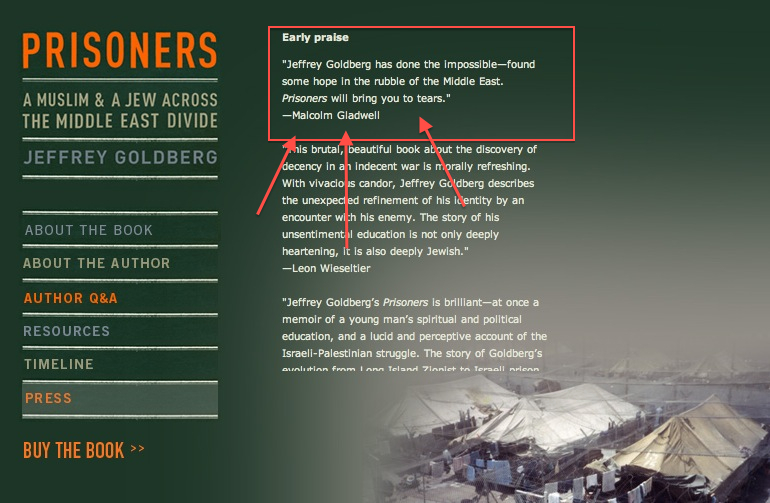 "Jeffrey Goldberg has done the impossible—found some hope in the rubble of the Middle East. Prisoners will bring you to tears." Ktzi'ot has long been criticized for its inhumane conditions, including frequent beatings, lack of drinking water and forced labor. Among the hundreds of books forbidden to prisoners at Ktzi'ot have been The Lord of the Rings and Hamlet. In the book, Goldberg describes a scene from Ktzi'ot in which his friend repeatedly hit a Palestinian prisoner in the head with a with a heavy, sharp-edged army radio, beating him to a bloody pulp, a beating that Goldberg "deduced was prompted by something [the prisoner] said." Goldberg admits that he lied to cover up the crime: "I found another military policeman, and handed off the wobbling prisoner, who was by now bleeding on me. 'He fell,' I lied." It was in February 1991, in the Wilderness of Zin, at a place called Ketziot, not far from Kadesh-Barnea, that a friend of mine named Yoram tried, in my presence, to beat senseless an Arab by the name of Abu Firas. Abu Firas was a disagreeable and smug man, but his sourness was not a mortal sin Yoram, whom I knew to be gentle but at that moment had blood in his face, was beating Abu Firas on the head with the handset of an army radio. The handset weighed five or six pounds, and it was sharp-edged. Abu Firas was hurt.
. . . Yoram was a religious Jew, and his kippah, knit and multicolored in the style of the modern Orthodox, stayed pinned to his head through his exertions It was quite a sight—a yeshiva Jew, a God-fearer, delivering a bloody beating.
. . . Abu Firas was on his knees, grabbing at his head. His hair shone with blood. He was barely coherent. He pleaded for water. Yoram tried to jack Abu Firas up onto his feet, but he couldn’t move. 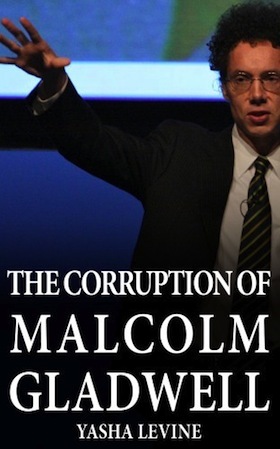 This isn't the first time Malcolm Gladwell has helped his old buddy out. In fact, Malcolm and Jeffrey have a long, rich history that goes back to when they were just two young conservatives trying to make it as media hacks in the big cruel media world of D.C. They roomed together in 80s, and both of them started off their careers in mainstream news at The Washington Post—Malcolm worked the business beat, while Jeffrey was a police reporter. Later on the two buddies reunited again at The New Yorker. Editor-in-chief David Remnick, also a Washington Post alum, hired Malcolm in 1996, and brought Jeffrey on board in 2000. Somewhere along the way, Malcolm Gladwell introduced Jeffrey Goldberg to the man's future wife. "[Gladwell's] responsible for the existence of my three children," blushed Goldberg. So, as you have undoubtedly heard, the Forward has chosen me as one of its 50 most influential American Jews. Me, Rahm Emanuel, Sarah Silverman, and Lipa Schmeltzer, among others. This honor has changed my life, especially the magnificent gift of 1,000 shares of AIG stock from the finance committee of the Elders of Zion. It has also caused heartache. Friends are envious, even non-Jewish friends. For instance, Malcolm Gladwell is very upset. When we were roommates a very long time ago, Malcolm used to listen to the klezmer stylings of Giora Feidman on his record player. He is, in other words, very Jewy. He is also deeply wounded. "I am so jealous," he wrote. "Shouldn't there be a parallel list for wanna-bes?" Yes, there should. If the Forward can publish a list of the top 50 Jews, then Goldblog can publish a list of the top 50 philo-Semites. I don't have a philosophical problem with this, by the way: I dissent from the line, first passed on to me by Frank Foer, who, tragically, is not a top-50 Jew (though his mother is! ), that philo-Semites are anti-Semites who like Jews. So, a list, and one loyal readers can help me assemble. I already asked Malcolm to provide me names of other philo-Semites, but he said: "How do I know philo-Semites? I'm such a philo-Semite I only associate with the real thing."